Review: a racing and blocking abstract for more players. One very nice thing about abstract games is that they frequently come with very simple-to-explain rules but often end up having surprisingly deep and interesting gameplay. Blockers is a perfect example: the players have a hand of 5 tiles, each with a different placement restriction, that they must place on the board while creating the smallest number of groups of touching tiles. Blockers is actually a re-edition of the game Uptown with a few changes. Compared to Uptown, Blockers has brighter colours, a board with little alignment rails to keep each of the played tiles in place, a much larger box, and lacks the rather spiffy art deco font for the letters and numbers (booo!) and includes a new scoring rule, where both captures and groups are counted in scoring. On balance it's a much more worthwhile first purchase than trade-up, since you can easily add the rule to Uptown. True to expectations, the rules are contained on a single sheet of paper in the top of the box, and in fact from a first read-through, the game seems awfully dull. Nothing really serves to change this impression during the first quarter or third of the game, where every player has obvious plays to extend one of their existing groups, so as to avoid creating any new groups that score against them in the end, however it is absolutely essential that you do not give up yet. 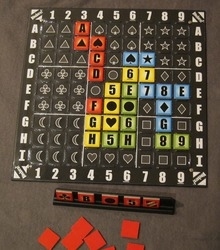 Each turn, players select one of their five available tiles and place it onto one of the matching spaces on the board. The board is annotated with 9 numbered columns and 9 lettered rows. In addition, the board is divided up into 9 3x3 square regions, like a Sudoku square, with each square having a particular symbol. A tile has either a letter, a number, or symbol on it, and can only be laid in one of the 9 spaces which match. Once the tile is laid, player draws a replacement from their shuffled pool of face down tiles. Each row, column, and symbol is represented exactly once in each player's tiles, so it's easy to thoughtlessly squander the precise tile you'd need later to complete a daring connection manoeuvre. Things get more interesting (and slower, as people make more careful choices) as play nears the halfway mark. There are no longer a multitude of free spaces (in fact, some of those easy placements are now to be regretted) so players have to think harder about each move. In particular, it is easy to have no remaining tiles that can be used to complete a connection between groups. Play is always possible into an empty space, but players are also able to capture opposing pieces by placing on top of them. Captured tiles are removed and placed in front of the capturing tiles where they count against scores later. It is not possible to make a capture that splits an existing group; all captures must be of edge tiles. Once a player manages to finish a connection between groups, it is too late for t heir opponents to stop them. Quick reactions are the order of the day, and any players not paying careful attention to their opponents can find themselves cut off and losing badly. Once each of the players begin to formulate their end-game plans, based on the tiles they have left and the tortuously few turns remaining to play them in, the tension in the game approaches its peak. Players are forced to make hard choices about which plans might work out, and which have been cut short, by enemy action, or simply by running out of time. This is also the point where spontaneous and lively table-talk tends to break out. The final score is the number of groups of connected tiles (only tiles with an edge touching are considered connected) plus the largest number of captured tiles taken from any one player. The tiebreaker is the total number of captured tiles. Including the captured tile count in the score (the major difference with Uptown) leads to a very different game. It is important to not unnecessarily capture tiles (unless you can move closer to joining your own groups), but once you have made a capture from one player, you are granted a free pass to match it with captures from the others without incurring any further penalty. This is a cute feature of the game, leading to quick shifts in your available options, once you're forced over the first hump. The designer has suggested another variant where each player keeps their special wild Blockers! tile face up, so that it can be used on any turn. This allows them to play this all-important tile at the best juncture in the game. The tile is sufficiently important that getting it on the last draw (where you have only a single turn to use it) is actually very frustrating. The variant neatly addresses this problem. I found Blockers to be an engaging light abstract game that's easy to find four people willing to play, it has earned a permanent place on my shelf of easy-to-organise lunchtime games.